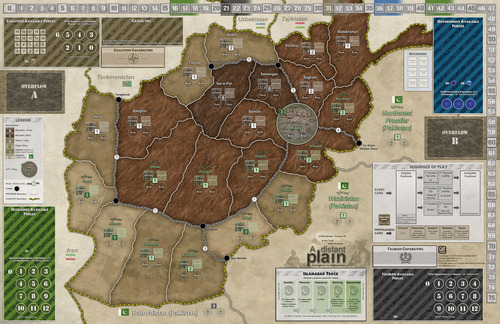 A Distant Plain (GMT Games) by Volko Ruhnke and Brian Train is the third game in the COIN series and as such uses the same core rules as the other games in the series. This is the first to explore a conflict that is still current, namely the conflict in Afghanistan between the forces of the Afghan Government, the US-led Coalition forces, the Afghan drug Warlords and the Talibans. As with the other games in the series, the game is playable by 1 to 4 players, with the game system taking over any vacant seats. The quality of the components is very high, amongst the best that GMT Games has produced, with clear, clean components, nice cards and a great mounted map. There are two booklets, one with the rules per se and the other one being a Playbook, with a long, clear example of a few game turns, a quick outline of the changes between this game and the first in the series (Andean Abyss), analysis, and background information. Also included are tons of player aids that almost eliminate the need to look up stuff in the rulebook during the game. All in all, a very thorough, beautiful package. 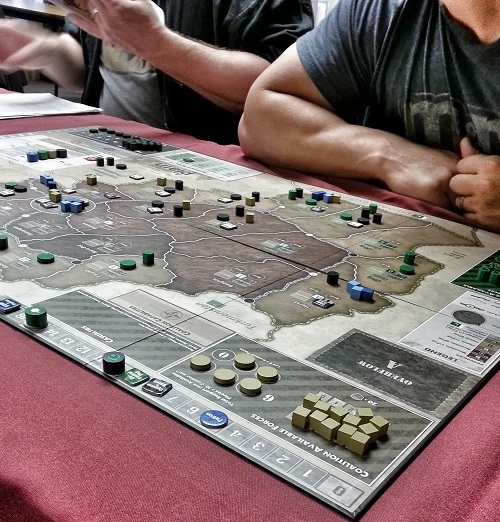 Since the core rules for A Distant Plain are the same as other in the COIN series, I’ll refer you to the Fire in the Lake (referred as FitL, from here on) session report instead of going over the rules in great details. I’ll simply cover the instances where the rules are different and what impact they have in the game. The first minor difference lie in the victory conditions, with once again each factions having their own way of measuring victory and while no one has the same victory condition, most of them are in direct conflict, but with different players. The US-led Coalition, the Afghan Government and the Taliban players have very similar victory condition to their equivalent in FitL, but note that the Support/Opposition status is a single state, no Absolute Support/Opposition here, The faction that is the most different is the Warlords, who must track two separate levels in order to win: Uncontrolled population, which must be above 15 and their total resources, which must be over 40. Again, these victory condition must be true when the Propaganda card is activated in order to win. There are no Turning Point cards here, so there is no way for the player to keep an Event card from happening and the Propaganda card do not modify the board situation. Instead of a change in government, there is a track that changes Islamabad’s stance, which affects the Taliban player and whether or not he can Rally troops there or not and can also be a great boon should the stance shift to Sponsorship, which allows for multiple Special Operation. 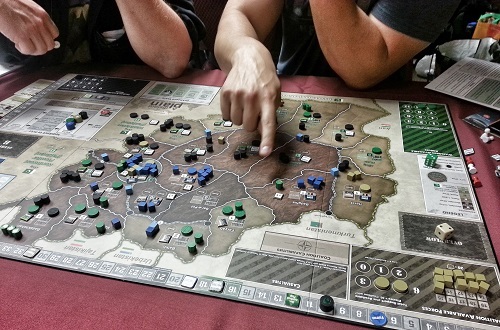 This stance is modified by the play of Events or Air Attack into Pakistan by the Coalition player and tends toward the Backing level, which allows the Taliban player to March or Rally to Pakistan for 0 Resource. While it is interesting and the players must keep an eye on it, in the games I’ve played so far it wasn’t that much of a factor or at least players did not use it a lot. As with FitL, some of the Event cards are Momentum cards, which stay in effect until the next Propaganda card and some of them are Capability cards that are in effect for the rest of the game. Note that these cards only affect the Coalition forces and the Taliban. Depending on the scenario played, the Coalition and the Taliban might start with one or several of these in play, simulating events that transpired before the game began. These cards can have a major impact on the game since they directly affect the Operation and Special Operation cards. When an Event comes up with one of these, think carefully about whether or not to use it. The Coalition and the Government Operations are similar to those of the US Army and the ARVN from FitL, with Train, Patrol, Sweep and Assault allowing the players to bring on new troops, move, flip over Guerrilla troops and eliminate them. Similarly, the Taliban and Warlords have similar basic Operations as the Viet Cong and the North Vietnam factions, with Rally, March, Attack and Terror allowing the players to bring on new units, move them, attack opposite units or create havoc with the economic infrastructure. The Special Operations show a greater difference from FitL, with the Coalition having: Surge, which allows them to move any Coalition pieces between 3 spaces and the Available box and may roll a dice and distribute the result between Aid and Warlord Resources; Air Lift, which allows the redistribution of Coalition Troops and up to 3 Government Troops between three separate spaces; and Air Strike, which is similar to FitL, allowing the player to remove 1 Active Guerrilla or Insurgent Base from up to 3 spaces. There is some interesting choices in there, including allowing the Coalition player to give Resources to the Warlord player. Why allow for that? Bribes, plain and simple, especially since you cannot directly harm the Government player. The Warlord player is doing really well, with all his bases placed on the map. Victory? The Government player can now: Govern, allowing him to gain Patronage but also place Returnee population onto the map, effectively increasing a space’s population by 1 for the rest of the game; Transport, which is the same as in FitL; and finally Eradicate, which allows the Government player to remove Warlord bases and gain Aid, Patronage at the cost of moving the population towards Opposition. This last operation allows the Government player to subtly affect the Coalition player, along with the Govern operation which allows the player to transfer Aid into Patronage, at the cost of moving the stance to Neutral. While the Government and the Coalition players must work together, keep in mind that only one player can win. Being too friendly towards the Coalition can easily result in a loss. The Warlord’s Special Operations really have no equivalent in FitL and are more akin to the Cartel from Andean Abyss: their main purpose is to make sure the local population doesn’t align with the Coalition or with the Taliban and make sure plenty of drugs are growing. As such, they have: Cultivate, which allows them to plop down bases; Traffic, which allows them to get additional Resources during a turn but which may give the Taliban some Resources as well or give the Government some Patronage; and Suborn, which allows them to pay some Resources to remove opposition units or hide Guerrilla units. 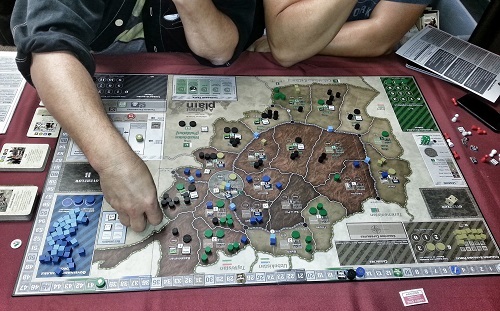 Note that they are the only faction that can gain Resources directly during a turn without committing an Underground Guerrilla and it is much easier for them to plop down bases, since they do not have to sacrifice Guerrilla units to do so. The Taliban have similar Special Operations to the Viet Cong, namely: Extort, which allows them to gain Resources, as long as they have Underground Guerrillas and have more units than COIN forces; Infiltrate, which allows the removal or replacement of units AND draining of Patronage; and Ambush, which is an automatic attack. The Taliban’s Special Operation are in line with their objective: not very flashy, but very powerful nonetheless. With their low victory point objective, it’s not about overwhelming the enemy, but rather establishing a very wide presence on the map. The limitation on Operations that take place on the last card before a Propaganda card do not apply here. Note also that only the Insurgent have Guerrilla pieces, unlike FitL which saw all forces have units that could go Underground. This is a minor difference and I’m not really sure of the impact on the game. I guess I need to play more to find out. I really like this series: I love the asymmetrical nature of the conflict and thus the game systems, I love how every decisions is very difficult and you never feel like you did the right thing, but most of all, I love the satisfaction when you’ve managed to put yourself in a situation where you are within striking distance of a win. Taliban infestation in the South of the map but they are still struggling. While the subject matter doesn’t appear to be casual-friendly, the game itself isn’t that complex, at least rules wise. Players who can handle the rules of a game like Pandemic, Clash of Culture or the like will have no trouble with the rules. Now, the strategy and what you are supposed to do and, even more pointedly, when to do it, is another story entirely. It is one of those games where you can never do exactly what you want and if you take too direct a route towards your goal, other players will go out of your way to let you see the more scenic view while they race for the win. Every action you want to do seems to have limitation and, this is truer perhaps of the COIN forces, you must plan your actions a few turns in advance. Trying to remove Insurgent forces isn’t easy: you need to reveal them first with a Sweep operation before being able to use Assault to get rid of them. This is why coordination is essential between those two factions. Depending on the scenario played, games can last anywhere from 3 to 5 hours, with very little downtime. Actually, because of the structure of the turns, it’s more likely that you’ll be sitting on the edge of your seat for the whole time rather than being bored to the point of breaking out a book, unlike some other wargames. The pace tends to the snappy, with decisions taking a very short time to implement. Is it a game for those who suffer for analysis paralysis? Maybe not, but since predicting exactly when your next turn will be, long term planning is very tricky. Rules and cards seem very clear so far, with very few questions coming up during play, but as with most games that have a deck of card at their heart, I’m expecting some unexpected situations to come up. Fortunately, the designers have been very good as far as answering questions so far, so again, time will tell. We were four player for this game, with Marc taking on the Taliban, Matt playing the Warlords, Dominick playing the Government and your truly taking over the Coalition. Everyone but Dominick had played before and had played other games in the series, but Dominick was ready as he had read the rules. The game played quickly and except for some strategy questions, we didn’t need to look up rules very often. Right off, the familiar tug-of-war started, with factions slowly setting up their strategy. Natural alliances formed, with the Taliban and the Warlords trying to work together, but unable to match the symbiosis that was happening between the Coalition and the Government. While this may seem obvious, setting up a good working relationship between the two factions is not that easy as the Coalition needs to be able to establish bases on the map, but can only do so with Surge. Being unable to gain enough of a foothold on the map was something that plagued us for the entire game, which was only exacerbated by the Taliban’s removal of our forces. The Warlord player slowly but surely established a presence in the North of the map, plopping down all of his bases for massive resource gains. His main problem was more in insuring that provinces would stay Neutral, something that was a real challenge to him. In the meantime, the Taliban established themselves in the south and east of the map, but while they had the mass, they were unable to bring Sharia law, and Opposition to the COIN players, to those regions. The first Propaganda card took everyone by surprise, coming up really early on, so no one was really in a position to win. By the time the second card came out, there were two clear front runners, mainly the Coalition, who was a few points short, but could have won if I was able to Surge my troops out (I could pull out 8 troops, for 8 points) and the Warlord who kept being 2-3 points short of his 15 points of Uncontrolled population but having more than the 40 points of Resources. It’s always difficult to balance the two conditions since they both have to be at a minimal level, unlike the other factions were they only have to add up to a certain level. Since I was working very closely with the Government, the Taliban and the Warlord players were accusing me of purposefully making him forget about his Patronage, especially since doing so would mean that he would remove Support token from key spaces. To this I say, well… things happen and people forget. If that benefited me, just view it as successful foreign policy. In the end, when the third Propaganda card came around, I was up to 34 points and this without Surging out of Afghanistan. Despite some last second wrangling between the other three players, it was too little too late, and the forces of good (or good enough) won. Great game with great players, this game, like others in the series, kept me at the edge of my seat for the entire time. Love it and will play it again soon. Thanks Stephane, I am glad you like this game! You’re very welcome. Looking forward to playing more COIN from you, Brian. Very good and useful review. I have the game but have yet to play it. It was difficult in some areas to follow, since it was being compared to a game not yet in print (as opposed to the other two games in the series, which are). I know what you mean, but if I hadn’t referred the reader to an Session Report that I had written before, it would have been twice the size! While Fire in the Lake isn’t out, the Session Report is quite in depth. I’ll probably do another SR on either Cuba Libre or Andean Abyss soon. Hello Stephane and company! Very nice rundown and session report, glad you gents enjoyed it. I agree with you that the effect of Islamabad is not overwhelming. But Islamabad can be important if the Taliban are doing well. The Islamabad track has a somewhat smaller effect than The Trail in FitL or US Alliance in Cuba Libre, but a greater and more variable effect than El Presidente in Andean Abyss, so it is a medium-impact mechanic in my book. Thank you for a great series and looking forward to the others! I have ordered this from Boards and Bits and am now very excited for its arrival on my gaming table , solitaire or otherwise. Great session report! Yesterday I tested the game with my friends. A strange thing happened and I’d like to share it. The first card we drew was the event that allowed the Warlord to turn 2 taliban bases into 2 warlord bases.The second card we drew was a Propaganda. The combined effect saw the Talibans forcedly expelled from the west and clinging to the few bases left in the east, sorely pressed by the Coalition in Nouristan. 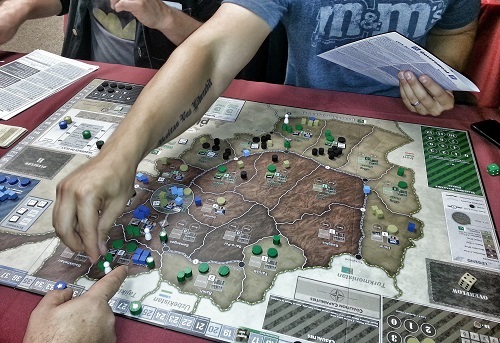 Thus, the whole game was unbalanced by the lack of taliban resources and taliban presence, that allowed the Coalition to retain control of the LoCs. We all feel that the Warlord choice at first round was unsound, and we look forward to a new game. Can’t really judge from such a botched start. Wow, sounds like you got a really bad starting hand, which I think is possible, but not typical. Hopefully you’ll give the game another try and things will go a little more the typical way.